St. Martin’s Press (New York, 2014). Among U.S. Catholic leaders, Cardinal Timothy M. Dolan is probably, due to his role as archbishop of New York and to the attention he garnered in 2013 as a potential candidate for the papacy, the most recognizable Catholic leader in the country. Just as he’s an excellent interview subject on the morning news programs, his life makes for interesting reading. Boyle does well in organizing the giant steps that comprise the cardinal’s life. Sandwiched between the run-up to the 2013 conclave and the election of Pope Francis, she sequences chapters covering the cardinal’s boyhood, life as a seminarian in St. Louis and Rome, parish ministry, graduate and doctoral studies, a five-year stint at the apostolic nunciature in Washington, two years as seminary vice rector in St. Louis and seven years as rector of the North American College, his rise through the episcopacy — auxiliary bishop in St. Louis, archbishop of Milwaukee and, seven years later, archbishop of New York — and his subsequent elevation to cardinal. As a reporter for the New York Daily News, Boyle began covering Cardinal Dolan in 2009, when he celebrated his final Mass in Milwaukee after being named archbishop of New York, and covered him through his participation in the conclave. Having conducted more than 100 interviews with family members, friends, classmates and former employees of the cardinal, Boyle compiles a profile that is known to those who have seen, heard and/or read about him: He loves and values his family; he is a loyal friend and devoted churchman; his grasp of church history is second to none; he is equally competent in standing toe-to-toe with the president of the United States and the governor of New York as he is in comforting a troubled member of his flock; and he sees his primary role as that of a pastor. While most of the interviewees are identified, on several occasions Boyle resorts to “one of Dolan’s classmates explained” and “Dolan’s classmate said” without explaining why the person isn’t identified. 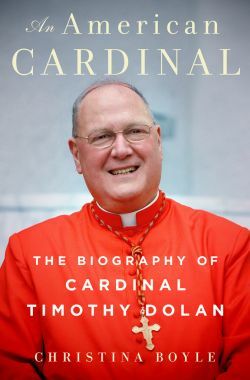 The book might have been more accurately titled “a” biography of Cardinal Timothy Dolan instead of “the” biography as John L. Allen Jr. in 2011 and the cardinal’s brother, Bob, in 2012, each wrote books about the cardinal that have biographical components. Nonetheless, readers get to know Cardinal Dolan well thanks to Boyle having had a couple of opportunities to shadow him as he went about his daily work and through the one-on-one interviews she did with him. Given he is only 64 years old, it is likely that Cardinal Dolan will have the opportunity to participate in another conclave. He might once again be considered “papabili” — one who could be elected pope. He will, by nature of his personality, his archdiocese and the media market in which it is located, remain a face and voice of Catholicism in the United States. It is also likely that other biographies will be written about him. For now, however, “An American Cardinal” provides readers with an enjoyable, easy-to-follow story about someone who is joyfully enthusiastic about the Gospel, proud to preach and practice it, and willing to defend it. Olszewski is the general manager of the Catholic Herald, the publication serving the Catholic community in southeastern Wisconsin.